♔ reCaptcha OCR - Eve.cm - Unlimited Plans for GSA customers - Page 13 — . :: GSA SEO & Marketing Forum ::. Hey, there is no problem on my side.. Damn JudderMan, that looks impressive! In fact it looks too impressive. Even with 10 retries that looks too hard to reach. Sure there isn't some kind of bug going on? I get 50-60% solve rates most of the days. Any comment on this, Eve? @Judderman could you post your setup? @rogerke I messaged @eve on Skype, he says I'm getting recap drop. You might be getting the same. @rogerke see screenshot http://prntscr.com/6enej7 for the latest week or so. @leafcrazy not sure what you mean. I run CB, EVE and Spamvilla, I put all details in both CB and SER (again, not sure if that's right but it works). I run a few retries on CB. Gonna pull Spamvilla out for a few days and see what numbers I get as I'm due a renewal on the 12th and I don't think I'll bother considering the amount of hassle that is being caused again by Kelvin. Not someone I want to pay money to even if the service works or not. Someone like EVE though, is friendly and their service works for me so I'm very happy being a customer for a long time. I definitely believed you, but as Eve pointed out it looks like the bug is caused by an older version of SER that you're running. The actual solve rate will be closer to 60%. It's probably a good idea to rerun your identified list a couple of times to squeeze out all the false-positive recaptcha targets (in case you didn't already). @eve and @rogerke thanks guys. I always run the latest version of eve...but I will take note and check progress. TBH I've just been letting SER run my processed lists so with huge LPM and good verified lists I thought I was just getting lucky with 100% success rates. i only get 24% success rates, is it normal ? i tried the 2k credit. If i use eve in SER, the success rate is low, like 25%. While in CB, the success rate is much higher, (showed in CB) even some recaptcha is wrong, it calculate it as correct. So i think you need to use eve in SER, then show you success rate. i paid for unlimited pack one.. 40 recaptcha per min..
why it is not activated yet? seems like some problem has occurred while payment by paypal..
ah it was my mistake yah! sorry lol! can u convert that 1$ into credits ri8 now? hi I just applied for trial of 100 captchas, and followed your instructions on gsa & also for captcha breaker but it doesn't deduct or solve anything and remains at 100 after I click test. If you click 'Test' you just see a balance. Setup Eve as 1st service and then run your Software. and your credits will be reduced. EVE emulator seems to be conflicting with CB at the moment. I can't seem to run them both at the same time. Not sure what I'm doing wrong, I'm fairly sure I set it up the same as on my previous servers. I only have GSA, EVE and CB running, not Skype or anything like that. If I shut EVE down and run CB then I get the same message. @judderman, you can't run CB and emulator at the same time. It cause an error, yes.. The other question is: why do you need it? Because if you have CB, there no need in emulator at all. 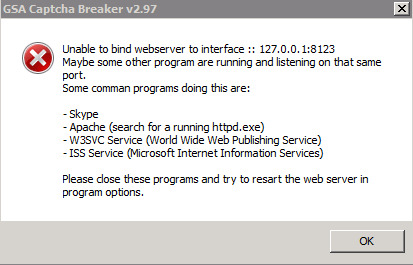 Please, try to restart your windows and then run CB only. Will you have this error again? hm... are you sure that have worked with CB and emulator at the same time before? I`ve tried your service with the 2,000 free credits and everything worked fine. I decided to go with one of the unlimited plans and as far as I can see it does not send any recaptchas to your service. I have eve as a first option in SER and Captcha Breaker as second. I`m using v9.70 for SER and the latest version for CB. If I hit test in SER, it says "Login successful. Your balance is: 0." Any idea what it could be? For your unlimited plan it will be differ. Sorry was being dumb, all sorted now. @eve Thank you! Working now. Can you fix me up a monthly plan please? Hello, guys. New customers can see that I have no free slots on the servers. Really can't add new server in order you can buy new packages. Please, wait until April 13. If I will not be able to solve my personal problems, then Eve OCR will work only for the current customers until they have money on the balance. How can i test the service?